Hop heads in search of the latest high have lately been clamoring for beers made with the aromatic variety Citra, developed in 2007. Three Floyds' beloved Zombie Dust pale ale is probably the best-known local example, but I've also reviewed a world-class double IPA from Pipeworks called Citra Ninja. 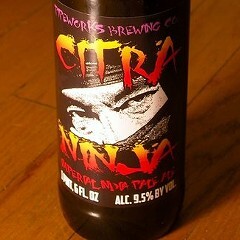 Given that the Pipeworks beer cost $10.99 when it came out last fall (a second batch is imminent), I was intrigued to see a Sprecher release called Citra Bomb priced at $6.49 for a bottle just as big. If it turned out to be anywhere in the ballpark as far as quality, it'd be quite a find. Citra Bomb hit shelves in December, and Sprecher are calling it their first imperial IPA—though they made a double IPA years ago, and I couldn't tell you the difference between the two styles. But point taken: Hoppy beers aren't the brewery's forte. Of the 39 Sprecher releases listed at Beer Advocate, 18 are German styles or lagers, as befits a Milwaukee operation founded in 1985 (before the American craft-brewing boom launched ales into the spotlight). Personally I see Sprecher sodas more often in Chicago—mostly their root beer, though they also make a "Puma Kola" with cinnamon and vanilla—but that's probably on account of where I tend to shop for my adult beverages. 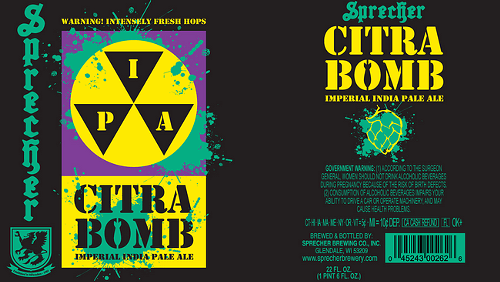 According to Sprecher, the inaugural 40-barrel batch of Citra Bomb was aged for six weeks on 100 pounds each of Citra and Simcoe hop cones, even after the ordinary dry-hopping process. Most of the bottles have been distributed in Wisconsin, but I've spotted a few at the Binny's in Lakeview and at Sheridan "L" Lounge Liquors. The label isn't encouraging, I admit, but Sprecher have established something of a tradition of silly labels, so it'd feel petty to hold this one against them. Because nothing says "delicious hoppy beer" like a fallout-shelter symbol that looks like it just lost a physical challenge on Double Dare. The head on Citra Bomb is loose and fleeting, but leaves behind a persistent skin of foam with a nice ring on the glass. The aroma—fruity, earthy, and herbaceous—is unshockingly citrusy, with orange peel and pink grapefruit pulp up front, followed by yellow peach, juniper, cedar, and green onion, with a bit of caramel malt underneath. The smell is the best thing about the beer, frankly. The mouthfeel is somewhat thin for an imperial anything (Citra Bomb is 7.8 percent alcohol, modest for the style), and the taste carries only a little of the fruit from the nose. I get mostly peach or nectarine, with no citrus to speak of except maybe some white grapefruit rind. The hops contribute sharp pine, white pepper, and spearmint; richly buttery caramel malts dominate the middle of the profile, and the long, harsh finish has a bitterness that's rather unfortunately like rolling an uncoated aspirin around on your tongue. For the price this is a fine beer, but you'll be disappointed if you're looking to get beaten about the head and neck with Citra hops. 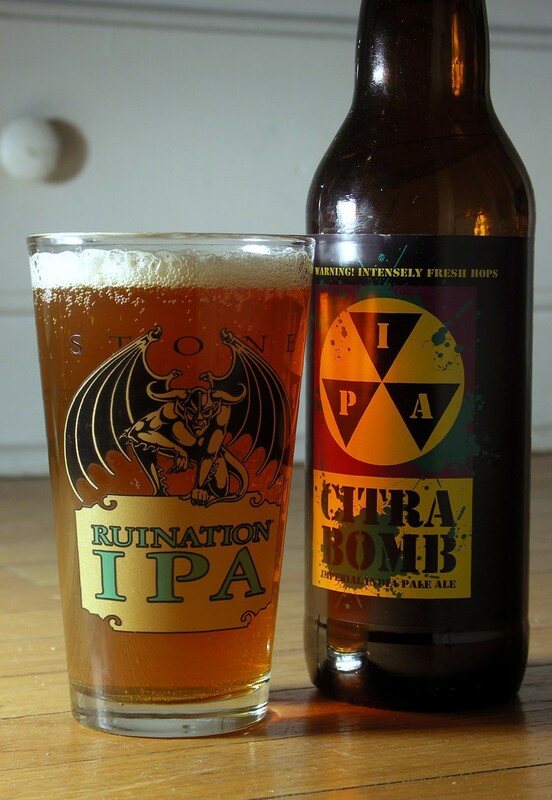 And if you're hoping for a budget alternative to Zombie Dust or Citra Ninja, Citra Bomb ain't it—though significantly cheaper than the latter, it's actually a little more expensive than the former. And it's nowhere near as good as either. Because I couldn't find a streamable version of the A Frames' "Neutron Bomb" (not metal, but so, so good), let's start with German thrash pioneers Kreator. This is "Bomb Threat," from 1995's Cause for Conflict. It's often referred to as an "experimental" album, where "experimental" appears to mean "does not sound enough like thrash." Next is "Underwear Bomb" by Loincloth, aka the rhythm section of Confessor (including amazing drummer Steve Shelton) in an instrumental trio with guitarist Tannon Penland. This one comes from last year's Iron Balls of Steel. Lastly I've got "Flee the Bomb," from an 80s California speed-metal band called Hellhound who sadly never managed to put out a proper album. Kindly don't take the title of the track as a snarky dig at Citra Bomb—I was happy to finish my bottle. Though the aftertaste is a little rough, it smells really good and drinks fine. It's just not the discovery I was hoping to be able to share. 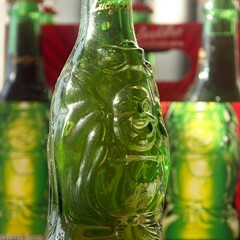 Should you buy the beer in the green Buddha bottles?